Golf GPS systems are becoming very popular on golf courses around the world. They are a great advantage for every golfer because they allow you to have updated information on the course and course conditions. 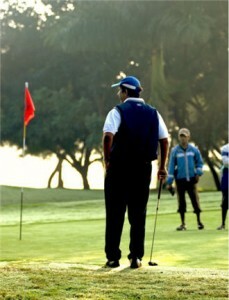 This information can include advice on the dangers around the course (just like a real caddie). This type of information helps golfers to judge the distance between the tee and the hole, the difficulty in hitting the ball and where to avoid the water and sand traps. It can even store information about the previous games you have played, allowing you to compare your scores and improve your game. Golf GPS units are being used every day on courses all around the world. It is possible to rent a golf cart with a golf GPS unit attached, and usually the golf carts with a built in golf GPS are the most popular golf carts at the course. The number of golf GPS units is increasing as new technology comes out. I have given a brief description of the five of most popular below. The Garmin Approach G6 golf GPS is a rugged, waterproof GPS system that is great to use, and its simple touchscreen interface gives you all the information you need just by touching and dragging the information displayed on the screen. The Approach G6 golf GPS uses a GPS receiver to measure individual shot distances and display the exact yardage to fairways, hazards, and all parts of the golf course. It gives you quick and accurate answers to the questions you have about the course you are playing. Plus there is a free database of golf courses preloaded into the GPS for free, and they add courses and updates for free via their website. Just make sure that your favorite courses are in the database. The SkyCaddie SG5 golf GPS is perfect for golfers that want a top of the range golf GPS unit to assist them around the course. 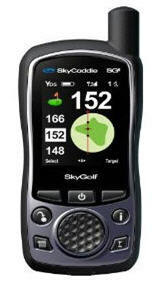 Distance to the pin is displayed in large numerals, but the SkyCaddie SG5 holds up to 40 separate targets (i.e. bunkers, hazards, etc) per hole. The target button allows you to toggle through the targets. The SkyCaddie SG5 uses the proprietary “Intelligreen” technology which gives you distances to the front and back of the green and all points in between. The SkyCaddie SG5 is different from the other golf GPS units because it measures the course from the ground (not via satellite images) this allows for better accuracy from the GPS. The SkyCaddie SG5 golf GPS is easy to carry and will undoubtedly help you to improve your game with the many features it holds. perspective to the game of golf. 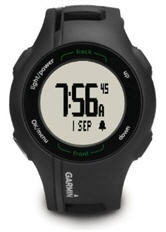 The Garmin Approach S1 GPS watch gives a golfer a golf GPS in its simplest form with the distances displayed in black-and-white. The watch GPS can measure your shot distances from anywhere on the course, and will also display the exact distance that you have walked throughout your round of golf. Like other Garmin golf products, the Approach S1 is pre-loaded with all the courses information from the Garmin database, and access to the course database for updates is free. The Approach S1 is extremely sturdy and waterproof, and automatically detects course proximity, so courses are easy to initiate. The beauty of the Approach S1 is that you can have all the course information you require on your wrist. How handy is that! The Callaway uPro Golf GPS is by far one of the best golf GPS units that a golfer can have as an accessory. It packed with all the latest technology and one of the best touchscreens on any golf GPS. Out on the course with this little beauty gives you feeling that you are watching your game on TV because the Callaway uPro golf GPS actually plays a video image of the hole you are approaching and highlights all the yardage lines to the pin. It includes the “SmartView” feature which displays all your targets and distances from an aerial view. Plus it has the Callaway AnyPoint technology built in to allow you to measure out any point on the course you are playing. 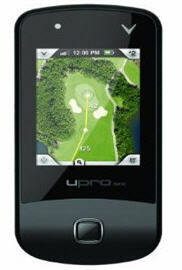 The uPro combines GPS with aerial and satellite photography to present full-color details on thousands of courses. You can download and install course information via either the Basic course package or the Pro Mode pack. Basic course information is free but the Pro Mode information is at a premium rate. 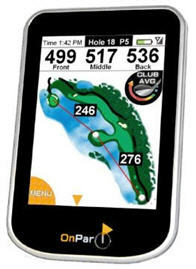 The OnPar is one of the newer golf GPS units and it was the first touch screen GPS that was designed specifically for golf. The touch screen looks and operates just like an iPhone. The On Par golf GPS views the distance from the golfer, to any target, and the remaining yardage to the green with a simple touch of the touch screen. It allows you to track your shots and receive club suggestions based on recent average distance for each club. The OnPar golf GPS unit does not charge for its course database or course updates. With its iPhone touch screen the OnPar Touchscreen GPS is one of the coolest looking golf GPS systems available to golfers. 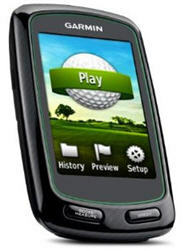 It has a user interface that is so easy to use it doesn’t distract the golfer to much during his round. In fact its numerous features like overhead views of all the holes on the course, the ability to determine distances to any point on the course, a multitude of statistic analysis and great views of all the greens make this golf GPS system a must have. A golf GPS system is becoming a necessity for all golfers whether you are just starting to play the game or are a seasoned club player. Why should your golf partners have this advantage over you? Get your own golf GPS unit and watch how not only will your golf game improve but you will shave strokes off your golf handicap pretty quickly as well. Tagged with: golf gps • golf gps system • golf GPS systems • golf GPS unit • Golf Handicap Filed under: Rangefinders Like this post? Subscribe to my RSS feed and get loads more!